American custom still puts animal protein at the center of the dinner plate. But some processors worry how they'll keep it there in the future. The USDA recently reported a decline in animal protein consumption, with both health concerns and the economy suggested as the driving factors. The safety of meat products is as much a part of the health issue as the desire to lower saturated fat and cholesterol intake. Yet Americans still get two-thirds of their daily protein needs from once-mobile sources, which is double that of the rest of the world. Experts have noted that interest in plant-based ingredients has led to a steady increase in consumption of vegetable-derived proteins as additives in animal protein-based food product formulations. They point to four main drivers: big demand for reduced- or zero- saturated fat and cholesterol products; increased interest in Halal or Kosher; sustainability and economic parity due to the high ecological and economic costs of animal protein, especially in poorer countries; and the overall cost of plant vs. animal protein. With that in mind, companies such as Roquette America Inc. (www.roquette-food.com), Geneva, Ill., have developed plant protein ingredients designed specifically for use in processed meat and fish products. The company's Nutralys is a pure and highly soluble pea protein used for its emulsifying and extending capacities, as well as the nutritional benefits of using vegetable protein and fibers to replace or extend the meat in products such as burgers and nuggets. Nutralys, developed in collaboration with French company Sotexpro, is able to replace 30 percent of meat protein as an alternative to soy-based ingredients. The company notes its main goal is to develop products that can achieve 100 percent meat replacement. Other Roquette vegetable ingredients that are being used in new, meat-based products, processed and convenience foods include gums and starches. Texturized proteins such as those from soy and peas become an excellent choice to replace or extend meat, reaching higher substitution levels by binding/holding water and improving emulsifying and gelling capacities of the food. What ingredient considerations and challenges should processors seeking a kosher or halal certification on their product be aware of? It goes beyond the basic processing issues, i.e. that equipment and supply need to conform to those laws, or that dairy and meat can't be mixed for kosher, according to Joe Regenstein, PhD., professor of food science and head of the Cornell Kosher and Halal Food Initiative. Regenstein directs processor to the finer points that might get missed, such as use of an ingredient like calcium derived from a dairy or shellfish source, or similar ingredients that could be a concern. "Some of the more subtle issue are the sources of highly refined products that trace back to animal products and what the rabbis rule on these," he says. "So ingredients like cysteine, calcium from shells, gelatin, and materials obtained from bio-reactors can be complex. And, because of different opinions, the acceptability from one rabbi to another might at times be challenged." Regenstein notes that lactic acid is not dairy derived. "Although there was an attempt at making a dairy lactate product from lactose, it was unsuccessful because the market didn't need or want a dairy lactic acid." Although they lower costs, carefully chosen meat product extenders and texture enhancers are not to be considered merely "fillers" or a way of cutting corners. The right ingredient will serve multiple functions, without sacrificing -- and in some cases even enhancing -- flavor and texture. Fiber is a commonly added ingredient to ground meat preparations or coatings and breadings for meat products. In such surface portions, they help retain moisture while increasing the crispness and cohesion of a coating. As a binder or extender, plant proteins and starches add attributes that impact texture and health. International Fiber Corp. (www.ifcfiber.com), North Tonawanda, N.Y., studied the use of pea fiber in ground beef patties using its Justfiber Inner Pea Fiber and Solka-Floc Powdered Cellulose ingredients. Ground meat patties lose more moisture and fat during cooking than a whole muscle protein product. This translates to loss of weight and shrinkage of the finished product. The extent to which cooked yield of the product may be impacted is also dependent on meat quality and cooking method. Typically, binders and extenders used to improve product texture, retain moisture and assure adhesion of the component ingredients in a product formulation will bind to the water but not the fat portion of the mixture. Some binders and extenders also will display instability during high-temperature preparation, which not only can damage texture but can lead to high losses on the product line in freeze-and-eat or ready-to-eat products. The wrong binders and extenders also will impact final product flavor and some even create spots of undesired gelatin texture in ground meat products. The IFC study showed that adding its pea fiber as a binding agent "can provide meaty texture similar to ground meat while exhibiting high water and fat retention under heat." The study also showed that "the addition of fiber in beef patties resulted in increased cooked yield and reduced shrinkage." Textural properties tested in the study gave subjective and objective evidence indicating the fiber-containing patties "were perceived to be acceptable with improved juiciness." As an extra benefit, the company reported a cost savings of about $38-$49 per 100 lbs. of cooked product. Cargill Inc. (www.cargillfoods.com), Minneapolis, makes its Prolia brand defatted soy flour as a way to similarly bind and extend ground meat products. It's a high-protein flour, at 54 percent total protein, and available in multiple grain shapes and sizes. In applications, Prolia can replicate the look and fibrous structure of cooked meat, while keeping a high percentage of protein in the final product. This allows it to maintain flavor profiles of healthier versions of processed meat products, replacing "substantial portions" of raw meat, according to the company. It helps increase yield, add juiciness and, since it's a defatted, it allows processors to lower the total fat content of the finished product. You can learn more about Cargill's products and product development ideas on their Formulating Ideas blog? 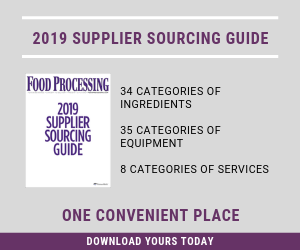 Food Processing and Cargill are working together to bring food processors the most up to date information on ideas in formulation. In chicken products, where flavor is easily impacted by even slight off notes, company taste tests showed that chicken patties manufactured with Prolia defatted soy flour replacing a full 10 percent of the chicken were "indistinguishable from all-chicken patties – and half the participants preferred them." Thus costs are decreased via both initial ingredient expenditure as well as reduction in loss of water and fat during the cooking process. International Dehydrated Foods Inc. (www.idf.com), Springfield, Mo., provides different alternatives for meat and poultry ingredients, such as dehydrated, frozen and shelf-stable concentrated chicken broth that comes in at 32 percent solids. The company also provides meat-based flavors that contribute rich, fresh, savory and roasted flavors and aromas. Such products include its spray-dried broth powders, derived from the broth of cooked chicken, turkey or beef, and meat and fat powders. These spray-dried and dry-blended products give natural meat or savory taste to a wide range of final products, while also lowering cost. A lot of flavor, especially savory and umami resides in fat. IDF also has a shelf-stable chicken fat that is light yellow and available with natural antioxidants, typically rosemary-derived varieties. The company uses no artificial ingredients or chemical antioxidants and only minimal processing. Applications include wet and dry soup and broth formulations, soup bases, sauces, gravies, stuffing, marinades and flavorants, as well as seasoning for rice, pasta and ramen-type noodle cups. Or, they can be applied to pot pies and similar finished products or in breading, batter, coating, stuffing and marinade formulations. Salt has been the primary meat flavor enhancer ever since cavemen chased down their kill in a dried up sea bed and noted what a finer flavor the prey had. However, and in spite of the growing recognition that dietary sodium only impacts a small percentage of the population, the demand for low-sodium products is still high enough that processors are looking for enhancers and reducers for their new lines. Natural, non-sodium flavor enhancers designed specifically for meat applications and heightened umami and kokomi characteristics are being derived from plant extracts. LycoRed Inc. (www.lycored.com), Beersheva, Israel, developed its Sante brand from tomatoes to act as a highly effective flavorant/salt reducer. It's composed mostly of glutamic acid, amino acids and maltodextrins and is an off-white soluble powder. It also is available in liquid form in several concentrations. Soy has amazing versatility for taking on almost any texture as an excellent analog of meat, poultry or fish. In addition to acting as a high-protein extender, soy also is a flavor enhancer with a centuries-old track record at boosting umami qualities. Amino acids -- in the ideal amounts and ratios -- are critical to the umami sensation that makes foods more savory and satisfying, according to Magda Dziembowski, foodservice coordinator, and Taku Otsuka, senior manager of technical support at Kikkoman USA Inc. (www.kikkomanusa.com),Oakbrook Terrace, Ill.
Barramundi—a sea bass-like fish with a clean flavor and meaty texture, is a true fish of the future. Australis Aquaculture (www.thebetterfish.com), Turners Falls, Mass., is a vanguard of a coming trend in aquatic protein, addressing the two huge yet often conflicting concerns with seafood, that wild-caught is depleting the sources far faster than they can be replenished and the aquacultured product is weakening the species while polluting the environment. Australis raises its popular fish in the world's largest and most ecologically friendly indoor systems. Using giant, 8,000-gallon tanks, with waters, temperatures and natural feed that replicates the fish's natural habitat, the company supplies an ecologically friendly, ultra-high quality product that is completely free of hormones, antibiotics and colorants —not to mention mercury, PCB's and other contaminants. "As much as sugar molecules interact with taste receptors to generate sweetness, glutamate salts of glutamic acid trip the taste receptors that generate umami," explains Otsuka. "Fermented foods like naturally brewed soy sauce contain the right quantities of amino acids in the right proportions -- glutamic acid being among the most predominant -- to act as natural flavor potentiators and umami contributors." The team notes also that glutamic acid appears to work synergistically with salt to "produce an exponential effect that is greater than the sum of its parts." This means that, while still a sodium-based product, these extra compounds in brewed soy sauces could, in formulation, help to slightly reduce overall sodium content. Soy sauce also provides a variety of benefits for stabilizing and preserving meat and poultry such as bacon, beef, chicken, jerky and other cured meats, add Dziembowski and Otsuka. Soy sauce products also add some deeper color notes, enhance preservatives, balance sweet and smoke flavors and help blend the flavors of spices added to meats. The ancient use of brewed soy sauce for curing meats and poultry is becoming more popular among U.S. chefs due to these complexities and attributes. For companies using meat as part of the chain toward a finished product, contamination and oxidation can be a challenge, especially with ground products with a huge increase in surface area open to exposure. This challenge can be addressed through the use of certain natural ingredient systems such as rosemary extracts. PL Thomas Inc. (www.plthomas.com), Morristown, N.J., offers Slovenia-based Vitiva Ltd.'s line of natural and healthy rosemary extracts for the use in meat products. As alternatives to synthetics, the rosemary extracts protect the meat fractions by inhibiting rancidity from oxidation of fats. "Rosemary extract solutions work to prevent or delay any undesirable flavor, color and taste changes caused by oxidation processes that take place in food, while improving shelflife and overall stability," remarks Ohad Cohen, Vitiva's CEO. Vitiva's oxidation management solution systems include its Vivox Aquarox, Inolens and Synerox product lines. All are 100 percent natural, certified kosher and can be labeled as "spice extract" or "natural flavor." No food ingredient finds itself at the point where formulation and food safety converge as strongly as animal protein, especially the highly processed stuff such as ground beef. The nation did not need the "pink slime" uproar to make it wary of anything other than whole-muscle meat. What seems a constant stream of recalls and scandals has been the smoking gun in the meat industry's own hand. Just in the past year, Dale T. Smith and Sons Meat Packing Co. recalled 38,200 lbs. of beef products, Cargill recalled 29,339 lbs. of ground beef, and Tyson Fresh Meats Inc. voluntarily recalled more than 130,000 lbs. of ground beef after an Ohio family became ill following a meal including the beef in question. And who can forget the Hallmark meat scandal of a few years ago? While these companies are not alone by a long shot, they're the most visible because they process huge amounts of animal protein products. According to Mintel Group, most consumers will positively react to organic, ecofriendly, and animal welfare-related labels on their products. Other surveys have shown that, even in tough economic times, consumers are willing to spend extra hard-earned dollars on social and ecological value-added products. This is why sources of humanely raised meat and poultry have seen demand often outpace supply. One example is Niman Ranch Inc. (www.nimanranch.com), Alameda, Calif., a collective of ranchers and farmers throughout the country providing humanely raised, cruelty-free meats and poultry. Importantly, the trend is leap-frogging, having jumped from the home table and upscale restaurants to larger chains and key suppliers to the foodservice industry. Bon Appetit Management Co., Palo Alto, Calif., a national institutional catering company with hundreds of locations across America, established a "humanely raised ground beef only" rule in effect as of last month. The beef will have to be certified by at least one of the four independent animal welfare organizations, something the company had already instituted for a third of the more than 1 million pounds ground beef it already uses annually. The company had already made the switch to cage-free eggs and sustainable seafood. This follows moves by the trio of restaurant giants Burger King Corp., McDonald's Corp. and Wendy's Co. in similar directions, toward shunning crate-raised animals and animal products. For food processors involved in the world of animal protein, kindness will be an ingredient of major concern as they compete in the coming years. Are We Heading to a (Mostly) Meatless Monday?